Rivacase 7860 Gaming Backpack is a multifunctional backpack designed for gamers. It is made from high-quality water-resilient scratch resistant fabric with shock absorbing EVA padding. The laptop compartment has padded sides and bottom to ensure that your laptop with up to 17.3-inch screen stays safe throughout your journey. The Rivacase gaming backpack contains multiple storage places for your gaming essentials including a zippered section, a USB bridge for your portable rechargeable battery to charge your devices on the go, and a Quick-access zippered front pocket. Front pocket is great for accessories like powerbanks, business cards, pens, documents and a smartphone. 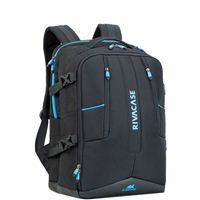 The Rivacase gaming backpack also has a trolley handle pass-through strap to attach the backpack to any rolling luggage, a side pocket for water bottle and additional zippered compartment for carrying small items, along with a hidden pocket on the back for a passport or wallet. Rain cover included. Quick-access zippered front pocket. Side pocket for water bottle and additional zippered compartment for carrying small items. Zippered section for all the necessary gaming essentials. USB bridge for your portable rechargeable battery. 13 x 8.3 x 18.9 in.